Opera Mini™ is a fast and tiny Web browser that allows you to access the full Internet on your phone. Take all your favorite Web sites and download images, MP3`s on the go with Opera Mini! 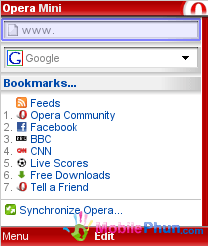 Version 4.2 of Opera Mini Web browser delivers several new features for personal customization and shorter loading time. Opera Mini users in the US and Asia-Pacific region can now experience faster speed, due to the addition of an Opera Mini server park in the US. This version also offers a sweet selection of new skins, bundled with improved support on more phones for YouTube and other mobile video services. It’s more likely that your phone will work on the mobile version of YouTube. Improvements in Opera Link allow users to share notes between their mobile phones and PCs, in addition to their bookmarks and recently visited URLs. Opera Mini browser enables you to take your full Web experience and digital lifestyle with you — everywhere you go. Opera Mini is free, so download it now! Opera Mini Web browser uses a remote server to pre-process Web pages before sending them to your phone. Web content is optimized for your device, ensuring fast and cheap browsing and a great user experience. Opera Mini™ Web browser offers the same speed and usability as the renowned Opera Mobile browser, and uses Opera’s Small Screen Rendering™ technology to provide access to the Web. It has all the features expected of a browser, and more, such as content download, skinning, bookmarks, browsing history. In addition, Opera Mini recognizes your phone and optimizes Web pages accordingly to provide faster browsing.